Liam Fox, co-owner of artisan bakery Fort Greene (Auckland, New Zealand), shares his delicious sourdough hot cross buns. "The origins of hot cross buns may go back as far as the twelfth century. According to the story, an Anglican monk baked the buns and marked them with a cross in honour of Good Friday. Over time they gained popularity, and eventually became a symbol of Easter weekend. At Fort Greene, we try to keep to the tradition while maintaining a high standard of quality. 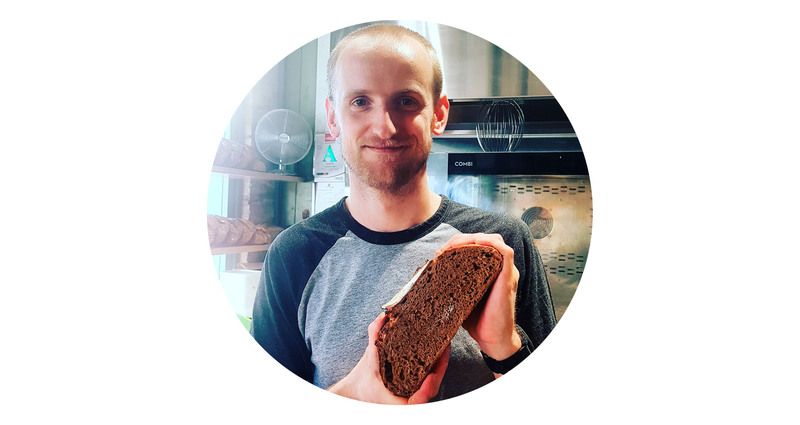 We use a combination of commercial yeast for consistency and our sourdough for flavour and texture." Dissolve yeast in milk and place in planetary mixer bowl with orange purée and eggs. Mix all dry ingredients except fruit and add to mixing bowl. Mix on low speed for 6-10 mins or until gluten has developed. Add sourdough starter or leftover dough along with butter and mix until incorporated. Mix 200g flour with dried fruits and add slowly while mixing. Leave at ambient temp for 30 mins. Divide into 40 or 50 evenly-weighted pieces and shape into tight balls. All buns should fit together on a standard 400mm x 600mm bun pan. Cover and prove overnight in fridge. Preheat oven to 180ºC (350ºF) Full humidity (if applicable). Eggwash thoroughly and pipe cross mix in cross pattern over buns. Bake for 30-40 minutes until buns are dark and cross starts to turn golden. Easter celebrations to suit everyone! Percy's Country Hotel (Devon, UK) has welcomed the first of its spring lambs. Lucky guests have the opportunity to get involved with lambing which is currently underway. They are also awaiting the arrival of new spring Beavers. Get involved in some Easter 'Egg'stravaganza Family Fun on Tuesday 23 April at Fordhall Organic Farm (Market Drayton, UK), or head along to their Family Spring Fair on Sunday 28 April. Find out where to have some fun on the farm here. Copper Pot (Seddon, Australia), are hosting their annual Seafood Road Trip menu this coming Good Friday. Enjoy a six-course seafood-centric meal for AU$95pp. Find out more, or book your table here. The fishers on Fogo Island gear up for the busy spring fishing season and coastal waters are filled with pack ice, just offshore. Discover the rich, centuries-old history, its wildlife, people, and culture and enjoy special treats that only the Easter bunny can dream up at Fogo Island Inn. Find out more here. New Scenic Café, Duluth, USA, celebrate their twentieth anniversary! "When it comes to sustainability, I consider two different facets. First is the matter of whether an item can be produced in a responsible and sustainable manner. Undoubtedly, this is very important. Second, and perhaps even more critical to my ability to make decisions about our menu, is whether a producer can offer enough of a product to sustain our needs as a business. We put quality of products first...if it then happens we can get a product we want in the quality we want locally, all the better." The New Scenic Café, nestled along the beautiful North Shore of Lake Superior, is a destination for thousands of Minnesota travellers all year long. And now the café is proud to share that it reached its twentieth anniversary on 1 April, 2019. The occasion is being celebrated during the entire month of 1 April with a Classics menu featuring customer favourites from the last twenty years. Congratulations! To read more about New Scenic Café, visit their Truth, Love & Clean Cutlery profile here. "We are most passionate about creating amazing flavours with ethical and sustainable ingredients using only plant-based produce. Whilst ethics and sustainability were major contributing factors for moving to a plant-based menu, we also had the health and well-being of our customers in mind. The dairy free cheeses we use on some of our pizze are also a much healthier option." "We have also made other changes; we stopped using plastic straws, now only giving paper straws on request and switched to biodegradable T/A packaging, and we don't stock any drinks in plastic bottles. We are constantly looking at ways to be as sustainable as possible." To read more about Gigi Pizzeria, visit their Truth, Love & Clean Cutlery profile here. "It is so worthwhile to place sustainability at the heart of what we do on a daily basis. It is more profitable and environmentally-friendly serving organic where ever possible, thinking about how we use energy with greener energy tariffs. We installed a new eco-friendly kitchen four years ago and focus on lighting, induction and how we save water, yes in Scotland! Ethical meat and sustainable fish are a given, if it doesn’t fit the set criteria then it doesn’t go on the menu. We choose to keep menus small, local, seasonal, and ethical, focusing on a lot more vegetables in season, reducing portion size and giving doggy bags too." To read more about Café St Honoré, visit their Truth, Love & Clean Cutlery profile here. "Our menu changes every month in order to follow the seasons and we always choose our new dishes depending on what is available locally. All of the produce we use at Embassy is locally sourced. We buy all our vegetables, fruits and herbs from local farmers who also grow it organically and for our meat, we always pay attention to the living conditions of the livestock. We are very careful to work with partners who respect the environment and animals." In early May, Chefs Pol and Sok Kimsan are opening a new space, just for them, called The Kimsans Lab. Located in bustling Siem Reap, the Lab, which is born from the idea of continuing to innovate and push the boundaries will be dedicated to expressing their creativity; searching and experiencing new recipes and combinations with no limits or constraints. Other Chefs will also be welcome to come and share some cooking time with the Kimsans. From time to time, a dozen lucky guests will have the opportunity to visit The Kimsans Lab to sample their very latest discoveries during pop-up dinners. The first event will be an eight course dinner, with two guest French chefs. To read more about Embassy, visit their Truth, Love & Clean Cutlery profile here. "Using seafood as an example; we buy from a local purveyor that knows the name of the captain on the boat where the fish were caught. We have a personal relationship with the purveyor, and he has personal relationships with the fishermen. That level of trust and commitment is how we ensure the quality and integrity of the food we serve." "It's simply good business to have as one of our core principals, a commitment to wasting nothing. In the kitchen, we find a use for everything. For example, all parts of the chicken are used: braised chicken on your salad, fried chicken bites, chicken 'stracciatella' soup. We found a way to repurpose day-old pizza dough into crackers, and we use our pizza dough as a pita-like pocket for a sandwich. Past-their-prime cookies are turned into cookie crumble for our buffalo milk soft serve ice cream." To read more about NOON All Day, visit their Truth, Love & Clean Cutlery profile here. "Our market garden is run according to the organic standard and our livestock are free-range on regeneratively managed pasture. We are transparent about how we farm and encourage customers to join us on a tour of the farm during lunch. Pretty much everybody who comes to eat here is expected to get their feet dirty by seeing where their lunch has come from. We have a handful of indigenous native plants outside the kitchen door, and have begun working with the local aboriginal community and bush foods experts to create a bush foods garden with upwards of forty indigenous plants for use in the kitchen, just outside the deck of the restaurant." "All our organic waste is composted on the farm, and we separate food scraps so we can use them for pigs, chooks, the dog, worms etc. We have also commissioned local winemakers to supply our wine in kegs to reduce the number of bottles we are recycling each week, and are carbonating our own water rather than buying it in." To read more about Fat Pig Farm, visit their Truth, Love & Clean Cutlery profile here. "Although our spices are not local, most of the other ingredients that we work with are. When we source olive oil, spices and condiments like pomegranate molasses from afar, we look for small producers that are likeminded and have similar values. One example is that we helped to bring organic pomegranate molasses into the country which is made in a women’s cooperative in the mountains of Lebanon. Our wine program follows the same principles. We use filtered water, biodynamic wines, and love imperfections and 'seconds' in the vegetable world." "Recycling, composting and using no chemicals is high priority for us. The chemicals have always been an obstacle but we are finding better alternatives for dishwashing and cleaning every year." To read more about Oleana, visit their Truth, Love & Clean Cutlery profile here. "At Neolokal, we believe in order to achieve the taste of the past we need to follow the same paths that have been there through the ages. Therefore we work with the best seasonal products which offer the best taste and are produced by good, fair and just farming. We have a garden where we apply and learn what mother earth offers us within the seasons and we seek out the producers that have been supplying the same quality products for generations. We do not only try to sustain products but also traditions, habits and cultures." To read more about Neolokal, visit their Truth, Love & Clean Cutlery profile here. "We are dedicated to growing and eating seasonally. Our food tastes great because we harvest and eat in tune with the British seasons. Everything that we grow is selected for flavour. Our set menu changes daily depending on what is in abundance in the surrounding fields, truly celebrating seasonal produce. If we don't grow it ourselves, we source as locally as is sensible. The Riverford Field Kitchen has its own garden and polytunnel metres away from the restaurant. Our polytunnels allow us to grow delicate salad and veg year round without artificial heat or light. Growing our own not only allows us to serve you veg that’s truly fresh from the soil, but also lets us experiment with using every part of the plant, leaving minimal waste." To read more about The Riverford Field Kitchen, visit their Truth, Love & Clean Cutlery profile here. "We source as much as possible from farmers, food producers and artisan cheesemakers within a fifty mile radius. Most of the food we buy is within a fifteen minute car ride. We most recently began our own growing program on the property producing small crops of fruits, vegetables, herbs and edible flowers. Our kitchen team forages in the most responsible ways that we can. Keeping our dollars within the community and contributing to the success of local businesses is very important to us – it supports our hardworking growers and producers and provides us with superior ingredients that we use to create beautiful food for our guests. We choose seafood that is fished or farmed in ways that have less impact on the environment and work with a fishmonger who personally curates a daily selection of native, seasonal, sustainable and premium seafood based on freshness, harvest method and harvest location." Recently Nick Moulton, chef at Mezze Bistro + Bar, won $36K in two episodes of Guy's Grocery Games on US television channel Food Network. Nick was a second-time champion on the show where he took home the winning prize of $20,000, a few weeks after his first winning of $16,000 on 13 March. Nick will compete in a third round of Guy’s Grocery Games with a date soon to be announced. "Our menu is delivered by seasonality. Our hearts are in north-east Victoria where we strive to support this emerging region and communities where we can. However, consistency also drives us, so where we can we support the north-east, otherwise we try our hardest to work with Victorian producers. We have planted olive trees on our farm which are not ready as yet, and are in the early stages of setting up our own sustainable farm, however this will take time and patience. We have amazing and loyal customers that share their bountiful seasonal produce, like quinces and figs, from time to time. We have a forager who sources local food elements for our dishes. We choose mainly to source ethically-farmed produce and work with like-minded suppliers when and where we can." To read more about Project Forty Nine, visit their Truth, Love & Clean Cutlery profile here. "Maní is a restaurant celebrating Brazil’s diverse food culture. The name of the restaurant is associated with manioc (cassava), an ingredient that symbolizes Brazil and one of the most versatile that we know of. In addition to manioc, we use many other native products, such as cashew, Brazil nut, a variety of peppers, palm oil, arrowroot, the honeys of native bees and açaí. We use leafy greens and vegetables in a way that respects their anatomy, without needing to give them an unnatural form, thus avoiding waste and using practically everything. What is not used goes into the food for employees, to avoid waste. Our chicken is organic and our fish do not come from trawling. We do not buy fish that is threatened by predatory fishing and only purchase whole fish that are in season." To read more about Mani, visit their Truth, Love & Clean Cutlery profile here. “Our menu is based around sustainability and changes as available produce does. We grow herbs, fruits and some vegetables on the property, as well as forage for as much as we can. I strongly believe restaurants should pick their location based on the produce available in the region and forge their style around making that produce work. Gone are the days of every chef wanting to cook with foie gras and imported caviar. By not offering a choice menu in the restaurant we are able to drastically reduce the waste and closely monitor volumes of food ordered. It's very important to us to use as many quality local products as possible. This goes for all things from coffee beans (roasted just over the hill from us) and tea, to our hand-made cups, saucers and plates." To read more about Hentley Farm Restaurant, visit their Truth, Love & Clean Cutlery profile here. “Fin & Pearl uses Bear Creek Farms, a sustainable grass-fed cattle and hog farm in Leiper's Fork, Tennessee, just outside of Nashville. Their cows and hogs are stress-free, antibiotic-free, and farmed using gentle methods. We value fair trade, organic and non-GMO products. As the seafood industry has become increasingly difficult to regulate, the restaurant is committed to working exclusively with purveyors that provide the highest quality fish caught by small, privately owned boats devoted to the sustainability of their catch. In addition to these relationships, Fin & Pearl follows the Monterey Bay Aquarium and NRDC seafood guidelines to ensure that we sustain the sea as much as the sea sustains us." To read more about Fin & Pearl, visit their Truth, Love & Clean Cutlery profile here. Chef Nick Moulton from Mezze Bistro + Bar (Williamstown, Massachusetts), shares two quick, simple and delicious summer recipes. They’re on the list: we applaud the TL&CC restaurants in the running for this year’s coveted James Beard Foundation Awards. Jerusalem's Ofaimme Farm joins MozzaPi, Copper Pot, HomeGrown, Northcote, The Long Paddock and Argentina's Los Galgos in our global spread of featured restaurants this week.